According to The Food Maven, Hortense Spier first started her business not as a pie bakery but as a brownstone restaurant on 94th St between Columbus Ave and Central Park West. The restaurant closed before World War II, and Mrs. Spier started baking her specialty pies for other restaurants. Besides the Nesselrode, there were lemon meringue, banana cream, and coconut custard pies. By the mid-1950s, these were the standard pies served in New York’s seafood restaurants and steakhouses. When Mrs. Spier died, her daughter, Ruth, and daughter-in-law, Mildred, continued the business. The pie was a popular dessert for the holiday season, as you can see in this 1965 article, “Nesselrode Pie Rings in New Year”. Although already by that point, the recipe didn’t necessarily include chestnuts in any form. Around the same time, chocolate was added, usually as shavings on top. Little by little, industrialization of the American food supply resulted in the dessert’s drift into mediocrity. Could you imagine a pecan pie without pecans? Or a banana split without bananas? Well that’s what the Nesselrode pie became. One can still buy a product called “Nesselro”, which is (or was?) made mostly of candied cauliflower — I still can’t decide if this is repulsive or intriguing. Mediocrity was followed by oblivion. The New York Times published a piece in 1983 claiming that “you will find the name Nesselrode on menus around the world”, complete with recipes for both a pie and a charlotte (the botched scan of the paper original makes these recipes very hard to read; the one for pie is also partially available here). Yet in the very same New York Times, we learn in 1988 that “Nesselrode pie left our culinary consciousness about 30 years ago and has hardly been heard from since”. Great journalism, guys! Fast forward 16 years, and The New York Times (them again) acknowledges in 2004 that the dessert has gone the way of the dodo a long time ago, and purports to have found what might be the very last Nesselrode Pie, available at Teena’s Cake Fair in Canarsie, Brooklyn. But alas, Teena’s closed a couple of years ago. And so, finally, it seems that the only way to try Nesselrode Pie today is to make your own. My recipe combines the old and the new. The chestnuts (prepared from scratch, just like the candied fruits) are the star of the show, and their flavor should be prominent. The addition of chocolate wasn’t a bad idea — the flavors pair well. So I kept the chocolate but used it in two novel ways, both in the crust and in a glaze. 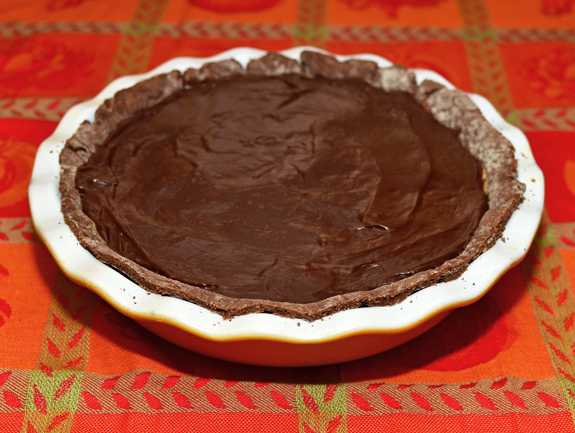 The chocolate crust has a hint of bitterness that balances the sweetness of the filling. It is important, however, that the chocolate glaze does not overpower the Bavarian cream, which is why I added cherry jelly to it (another idea would be to add chestnut purée instead). Carefully peel and separate the orange into its natural segments. Reserve the segments for another usage. Cut the peel into 1/4″ x 3″ strips. Weigh 1 oz, and discard the rest. Blanch the orange peel in boiling water for 7 minutes. Drain and repeat two more times. In a small saucepan, heat the water and sugar to 230 F, stirring constantly. Add the peel, cover, and simmer over very low heat for 1 hour. Drain the orange peel, and let cool on a rack for 30 minutes. Place the dried cherries, golden raisins, orange peel, maraschino, and brandy in a small saucepan. Cover with a lid and heat over low heat for 10 minutes. Remove from heat, and let rest for at least 1 hour. Boil the chestnuts in a pot of water for 5 minutes, then drain, and reserve. Place the sugar, water, and vanilla extract in a small saucepan, and heat until dissolved, stirring constantly. Transfer the sugar syrup to a blender with the chestnuts, then process until smooth. Reserve. Sift the flour, cocoa powder, confectioners sugar, and almond powder into a bowl, and make a well in the center. Put the salt, egg yolk, and butter in the well, and combine using your fingertips, starting from the center outward. Add the water, and mix until smooth. Cover with plastic wrap, and refrigerate for about 45 minutes. On a floured surface, roll the dough to a 13″ disc. Transfer the dough to a 2″ tall, 9″ diameter pie dish, leaving any extra to hang over the sides (it tends to shrink when baking). Prick with a fork, and bake in a 400 F oven for 15 minutes. Take out of the oven, and let cool. Cut off any extra dough remaining over the sides. In a bowl, whisk the egg yolks and sugar to a pale ribbon. In a saucepan, bring the milk to a boil. Temper the egg yolks with the milk, then return the custard to the saucepan. Heat over low heat, constantly stirring with a spatula, until the custard coats the spatula. Mix in the chestnut purée and gelatine, then remove from the heat. Process the mixture with a hand blender, and let cool for about 1 hour. Whip the heavy cream to medium-firm peaks. Fold the chestnut mixture into the whipped cream, and carefully stir in the Nesselrode fruit mix. Beat the egg whites to medium-firm peaks, and fold into the mixture. Proceed with the assembly immediately. Pour the Nesselrode Bavarian cream into the chocolate pâte brisée. Level with an offset spatula, cover with plastic wrap, and refrigerate for a couple of hours, until set. In a saucepan, bring the heavy cream, milk, and corn syrup to a boil. Add the cherry jelly and chocolate, let stand for 1 minute, then stir until homogeneous. Let cool to 90 F.
Gently pour the chocolate glaze over the pie. Use just enough to cover the pie — you might have some glaze left over. Refrigerate for another hour, then serve. I remember fondly the Nesselrode Pie of the 1950s and early 60s served at Miller’s Restaurant, located in the Woolworth Building NYC. 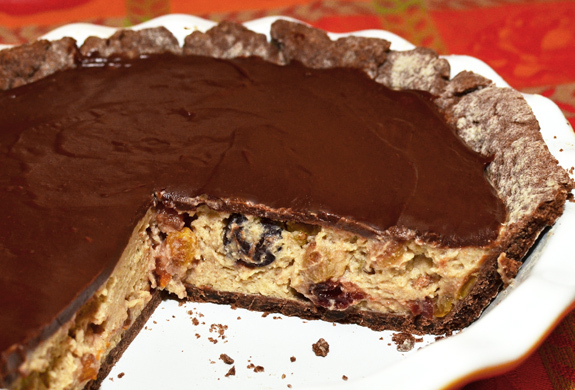 The savor of chestnuts was a delight, the candied fruits taste jewels, and the pie was topped by a dome of Bavarian cream and chocolate shavings. It was fabulously rich in flavor and texture.